Database Systems Corp. (DSC) provides both voice broadcasting phone systems and outsourcing services. DSC has also developed an Android application to manage this service remotely. DSC voice broadcast clients now have the ability to manage their calling campaigns using the latest Droid devices. From initiating calling campaigns to managing the operation and control of these calling programs, our customers can have the freedom to perform these tasks with simple selections from the Droid device. The Droid voice broadcast application is ideally suited for use with emergency voice broadcasting. If your organization or community is experiencing an emergency situation, it may not be practical or possible to use a computer or laptop to initiate an emergency broadcast. Using a smartphone device may be the best option available to an administrator to send calls to your community. 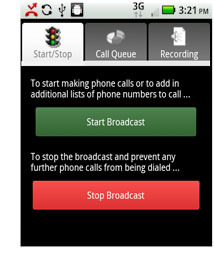 The Droid application and iPhone Voice Broadcasting App from DSC is available for free to its voice broadcasting customers. Once enrolled in our voice broadcast services, DSC provides an easy access to download this application onto your smartphone. DSC now provides an online signup for non-profit and commercial organizations wishing to use our voice broadcasting services. Online signup lets you get started immediately when you accept our terms and make online payments using our convenient and secure website. Or request a contract online and a representative from DSC will contact you and help you register for our service. To register online, click on the online registration image. Contact DSC to learn more about our voice broadcasting solutions and droid management tool. 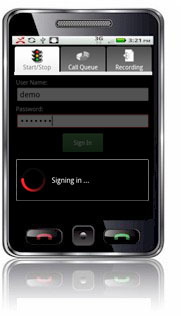 The Droid voice broadcast application lets administrators initiate and manage calling programs from their Android phones. The following functions can be performed using this device. The DSC Droid application allows an administrator to view the progress of each calling campaign that is running. Total number of calls is displayed. DSC voice broadcast clients all have the ability to record their voice messages using our 800 phone service. This capability has also been provided to Droid users. Contact DSC for a FREE analysis and quote and to learn more about our voice broadcast services and Droid phone application.